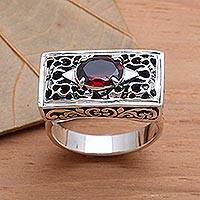 Welcome to Novica's Filigree Ring Collection! I absolutely love this ring purchase. This is extremely well crafted and just beautiful. You will NOT be disappointed with the quality. It is very durable as well. I have been wearing it on my thumb and doing all household chores. It is not bent or disfigured in any way. 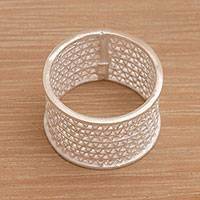 This sterling ring is gorgeous on. The craftsmanship is of the highest quality. The price was very reasonable and I?m so pleased with this purchase. 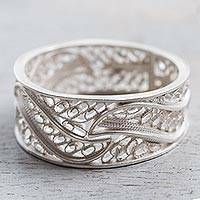 Artisan Crafted 950 Silver Filigree Band Ring from Peru, "Three Waves"
The magic of filigree art has been admired throughout time, and throughout the world. 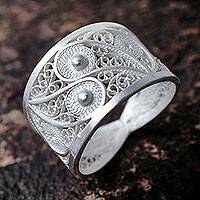 Patterns of delicate artistry result from these techniques, once mastered by all silversmiths as part of their training. 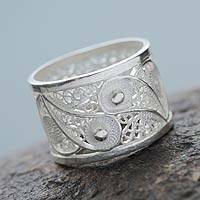 Nowadays, filigree is a specific branch of artisan jewelry mastered by only a few. 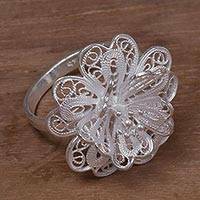 Novica invites you to appreciate how artisan silversmiths from around the world have transformed this millenary art into original filigree rings. Catacos, in Peru's Ayacucho region, is renowned for its filigree tradition. Brought over from Spain during Colonial times, the delicate art of filigree jewelry is preserved by today's artists and their contemporary designs. 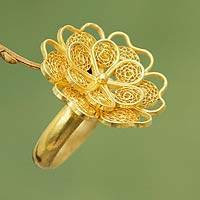 Silver rings or gold, crowned with a pearl or blossoming into a three-dimensional flower, filigree rings given as a gift are destined to become timeless heirlooms.